Kanji has its roots back to the hieroglyphics in ancient China. As in any civilization, creating a writing system was a way to express what people saw and experienced in everyday life. Riding the train, eating at local restaurants, working at the office, exploring the city, even buying a drink from a vending machine, Kanji follows you everywhere in Japan. While it is possible to get by with a mix of English and Japanese, for those who really want to experience everything that Japan has to offer, learning Kanji is a must. Kanji looks complicated and indeed it requires a lot of time to learn – the average high-school graduate is expected to know 10,000 individual characters! However, what it does not require is talent. For those who are terrified at the idea of learning Kanji, here is one piece of good news, it’s logical. Once you know how it functions, learning Kanji can be profoundly interesting. Although a lot of time has passed since the Kanji system was first developed, we can still see today what the originators of the language saw in their time. 1. 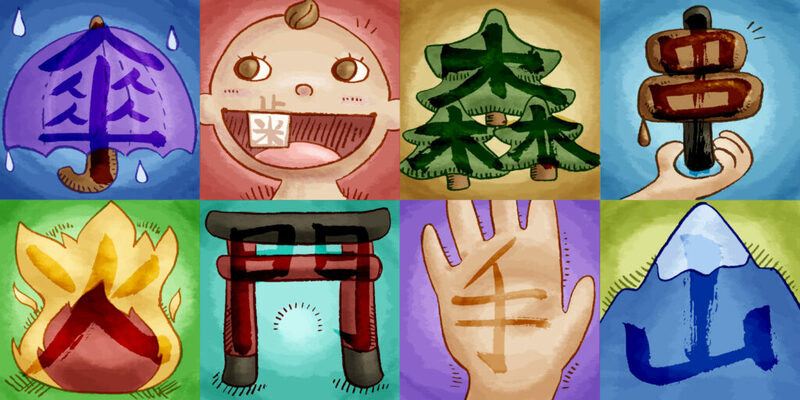 森もり・Forest – the kanji for forest is three trees (木) put together. 2. 父ちち・Father – imagine a man holding two sticks over his head. 3. 雨あめ・Rain – looks like rain hitting a window. 4. 川かわ・River – three lines show the flow of a river. 5. 東ひがし・East – is made out of two kanji 日 (the sun) and 木 (trees). An easy way to remember is that the sun is rising from the east behind a tree. 6. 男おとこ・Man – You can break this kanji into two parts; 田 rice field (た) and 力 power (ちから). It describes a powerful man working in a rice field. 7. 姉あね・Older Sister – Since the common duty of an older sister was going to a market, the kanji 姉 is made out of 女 woman (おんな) and 市 market (いち). 8. 虫むし・Insect – is a kanji to indicate insects, but back then it was also used to describe snake-like animals, both real and mystical, such as dragons. 9. 虹にじ・Rainbow – This is a unique kanji because it shows us how the originators of the language perceived natural events that they didn’t understand, such as a rainbow. The ancient Chinese thought a rainbow looked sort of like a dragon, and, as the kanji 工 describes a motion of penetration — a rainbow was a dragon stroke through the sky. The last is a very simple and funny-looking kanji. 10. 凸凹でこぼこ・Bumps – Perhaps Tetris did exist in ancient China?